A Diamond Select Release! Sculpted by Patrick Piggott! Saving is logical, but busts are fun! 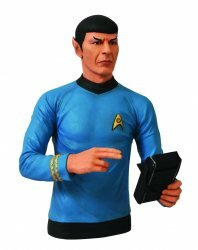 Satisfy your human and Vulcan halves with the first in DST's fascinating new line of Star Trek vinyl bust banks! This 8-inch rendering of the USS Enterprise's famous first officer has a coin slot in the back and an access door in the base so you can store your spare change, as well as your conflicting emotions! Collectors Note: These cool vinyl banks were featured on display at the San Diego Comic-Con and are very well done. Comes bagged not boxed from the manufacturer. 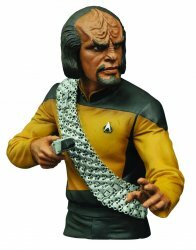 Also want the Worf Bust Bank? Click on the handy Buy Both button below!